In Switzerland, Swiss watches are tested by the Contrôle Officiel Suisse des Chronomètres (COSC) which is the official Swiss chronometer testing organisation. During the testing, the watches are observed and their precision and accuracy noted. Only those that achieve satisfactory performance merit being called a chronometer. Suppose that Schrödinger’s Clock® was submitted for such a test procedure. When it was not observed, it would tell the right time or the wrong time. However, every time it was observed, it would tell the right time (Now). So – would it qualify to be called a chronometer? The Oxford English Dictionary definition of a Clock begins, "An instrument for indicating or measuring time” and goes on to elaborate on the mechanisms. Wikipedia is not much better, "A clock is an instrument to measure, keep, and indicate time.” Implicit in both these definitions is the the “time” that is indicated is ‘NOW’. At least Schrödinger’s Clock® is clear on this point. If you don’t look at it, it may (or may not) be telling the right time. Or it may be showing the right time somewhere else. When you do look, it will tell you what time is NOW. 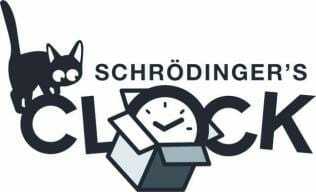 So, is it right to call Schrödinger’s Clock® a ‘Clock’? • What does a clock do when it's hungry? • Why didn’t the clock work? • What time is the best time to go to the dentist? • Why did the girl sit on her watch? She wanted to be on time! • Why did the boy throw the clock out the window? The Oxford English Dictionary definition of a Clock begins, "An instrument for indicating or measuring time” and goes on to elaborate on the mechanisms. Wikipedia is not much better, "A clock is an instrument to measure, keep, and indicate time.” Implicit in both these definitions is that the “time” indicated is ‘NOW’.